Ann Hamilton in collaboration with Anne Bogart and SITI Company, performance view of the theater is a blank page , 2018. Photo by Reed Hutchinson. Courtesy of UCLA’s Center for the Art of Performance. In 2008 I had been living in New York City for about a year, cobbling together work as an artist assistant, when I received a message from Ann Hamilton’s studio inquiring about helping with an upcoming project, human carriage , at the Guggenheim Museum. For three months, I served as the main attendant of this work. My task was to activate a system of many moving layers of ascent and descent that enveloped the circular space of the museum, through meditative acts of daily care. Several years later, our dialogue continued when I assisted backstage in facilitating the movements of a large cast of performers, while also taking part as both a reader and writer in the expansive installation the event of a thread (2012) at the Park Avenue Armory. Ann makes space in her work for others to inhabit, withness , as she calls it, allowing connections to buoyantly merge, embody, and transcend. In her immersive works, inclusivity dissolves the boundaries between inside and outside, forming a collective thread where all of the senses are activated—hands become tools for listening and the mouth an aperture for seeing. The tactility of language, the page as a place of encounter, and the body as a site of reception—these are elements of engagement we both share in our work. Ann is the most perceptive, hard-working, and generous artist I have ever had the pleasure of working alongside. Our conversation took place in her apartment in New York City. Ann Hamilton and Audra Wolowiec, a conversation , 2018, pages of found books with tape on paper. Ann Hamilton You and I are currently doing a project where we exchange threads of language fragments. We each have a plastic bag full of sliced-up paperback books, chunks of pages untethered from their original context. I have no idea where the texts are from, though an occasional title appears in the mix. AH They’re real mixed bags, quite literally. Some of the book fragments still have the binding on them, but the quarter-inch slice holds only a single line of words from each page—enough to sense the genre and, if you flip through, a slight glimpse of narrative. The process is sifting through and finding bits of language that stand out from the pile. It might be a word, phrase, or sentence containing a suggestive tension. One of us selects a line and sends a picture of it to the other, who then sends a line in response. When I’m sifting through the words, I lose myself completely. It unleashes the incredible pleasure of broadly associative thinking, as selected fragments start to construct something between themselves. Why would I choose one section of a line over another? There’s really no rhyme or reason. But now I have all these fragments that are meaningful to me. I could do this all day and be content. AW It’s wonderful to receive a line of text over email in this form from you. I’ve been writing them all down on a piece of paper to help follow along. AH I tend to only follow the line that came before, not the whole thread. AW Sometimes a response will be too narrative, or correlate too closely, and there’s not enough space. A line that doesn’t fit as well can feel more buoyant. You sent one about birds that was so beautiful. It really opened things up, and it took a while to find something that would follow. AH Now we have a double thread going back and forth because one time I couldn’t decide which was the best response. The lines split, like a family tree, and maybe it will split again as we go forward. But the whole structure is one of responsiveness. We pull meaning from this mass of undifferentiated material and offer it like a gift to the other person. And it’s not just about the language. Sometimes my choices have to do with the object quality—the yellowed paper, the size and style of the font. This back and forth of text fragments, which I originally did by myself, is more surprising to do with you. I think we’re onto something that could be ongoing—like exchanging postcards. We don’t have to worry about what it becomes yet. Or even if it’s anything. For now, I trust the process. It’s alive and if we give it time, who knows? AW Working with these fragments of cut texts has been part of several projects of yours. Where did that idea come from? AH It started out with human carriage , the project you participated in for The Third Mind: American Artists Contemplate Asia , 1860–1989 at the Guggenheim. The exhibition curator, Alexandra Munroe, and I had a conversation about the influence of Asian texts on Western artists before the age of the Internet, and how those texts circulated in translation. AW I very much felt in the role of a caretaker. There was an element of timekeeping as well, related to how often the system was activated. Several times an hour, I released a carriage containing two Tibetan cymbal bells enclosed in a layer of silk, which slid on a track tracing the spiral trajectory of the museum’s rotunda, from the top floor downward. The ring of the bell resonated through the space. 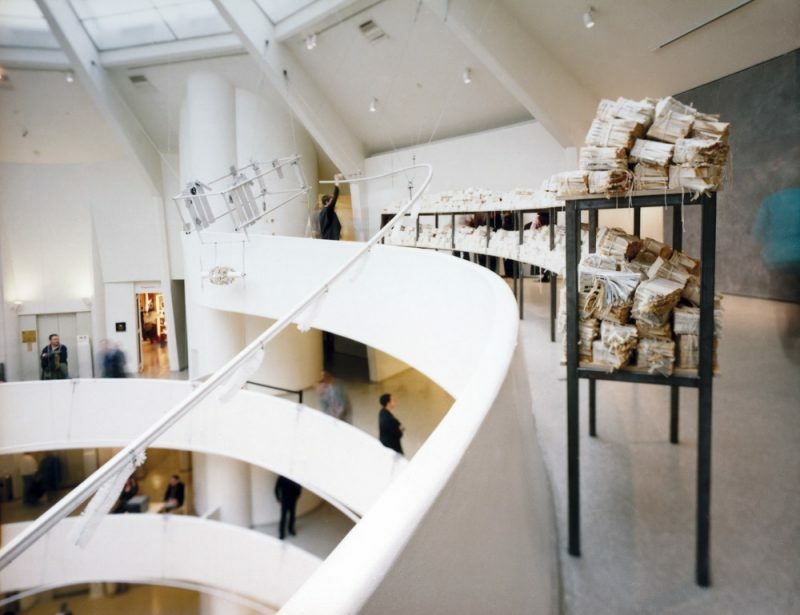 When the bell carriage finished its spiral and reached the bottom, it released a cluster of suspended “weights” made from the combined fragments of book pages, which then accumulated in a large pile on the museum’s ground floor. These book weights were secured with strings, allowing the sculptural forms to suspend in groups, like balancing scales. I stood five stories up, watching this release take place, ready to hoist the bell carriage back to its starting position and attach more book weights for the next round. Between this activation, circumnavigation, and material transfer, some of the pages would become loose and detach from their spine, landing on various floors of the museum. Throughout the day, I would gather these fragments, and sometimes people would bring them over to me. AH Deliver them to you, sort of like a fortune cookie without the cookie? I had a lot of people help me make the cut-up book bundles because we needed a large supply for the piece—each one was like a portrait of of the hands of the person who made it. A portrait without a face. I am still quite interested in them as a way to think about how the sensibility of a hand comes forward in touching materials. You can give the same material and process to fifteen people and their sensibility toward and touch of those materials is individual. AW You leave space for this material conversation to take place. Your work is not a chance operation because there is always some built-in structure, but there’s no script. It’s a generous act. In the event of a thread at the Park Avenue Armory, you introduced similar acts of generosity, by inviting people into the work, both as visitors to the space and as participants—readers and writers—activating the work. AH I’m interested in the conditions that invite someone inside a project or a process. The work is very demanding—it asks you to relate to it on multiple levels simultaneously. 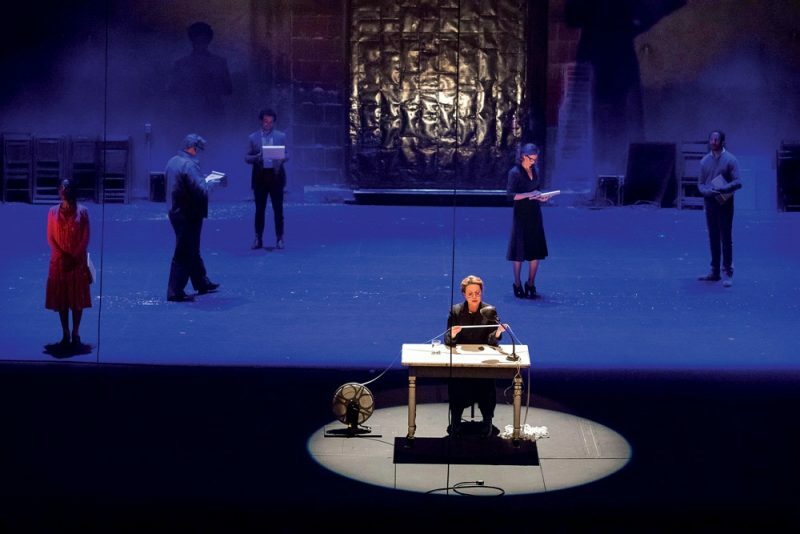 For the project at the Park Avenue Armory, the readers were members or students of SITI Company, a collective of theater artists. Rather than scripting what they read aloud from their individual concordance scrolls, I asked them to read across the central spine of words that constructed each scroll, selecting lines and line lengths as they liked. The improvised reading became an act of composition with each reader responding to the text, each other, and the weather in the room. The writers at the far end of the space were writing letters addressing qualities of the space: “Dear Light” or “Dear Air” or “Dear Motion,” whatever writing would come to them from that. I’m always occupied with how a project can create a condition that allows people to form a relationship to it, one that they’re authoring, where they’re agents. Their own volition is present, but it’s not about being interactive. I invited people into the space, but I didn’t tell them what to do. It’s not going to be the same experience for every single person. To what degree does something need to be open? And to what degree does it need to be structured with parameters and guidelines? AW Trust is also important, for the artist and for the participant because you enter into something that has a set of conditions, an internal structure that you want to honor. AH As a participant, you’re also trying to figure out, What am I supposed to do? And what do I want to do? How can I be present within this? AW You invite people to be listeners and also responders, which seems similar to your own way of approaching a site or place. AH How do you use response in your work? AW I often respond to the writing of others, or in relationship to a site, how one’s body moves through a particular space, and the experience of an embodied listener. When I work with performers, I have an idea of what I would like the work to be, but I rely on their individual skill sets and experiences. I learn so much from working with other people. I’m interested in voice, but not being trained in vocal performance, it’s crucial for me to understand how someone who has these skills might interpret a set of ideas. AH I’m interested in the pieces you’ve made where the sound carries the emotion or rhythm of what someone’s saying, but not the actual content or meaning of the words. AW I often try to find ways of expressing voice or speech in the absence of language. In the project private space in a public time , which I showed at MASS MoCA (2016–17), I was extracting parts of speech that go unnoticed. I recorded myself reading Vito Acconci’s Public Space in a Private Time , then edited out what I considered to be the “public” elements, the known or understood vocalizations that make up words, leaving the beginnings and endings of each word and the “private” breaths in between. What a visitor heard when walking through one of the connector tunnels at the museum was a condensed series of stops and starts, a guttural experience of speech. As a corresponding visual score, I erased the physical words, then drew a rounded slur underneath the spaces, creating a series of joining lines. I was thinking of Roland Barthes’s grain of the voice in relationship to what the thread of the voice might look and sound like.